It was predictable, but still, it happened: as the whole world was focusing on its first ever diver’s watch, the outstanding new Ballon Bleu from Cartier went out of sight. Too bad : it’s an outstanding piece. 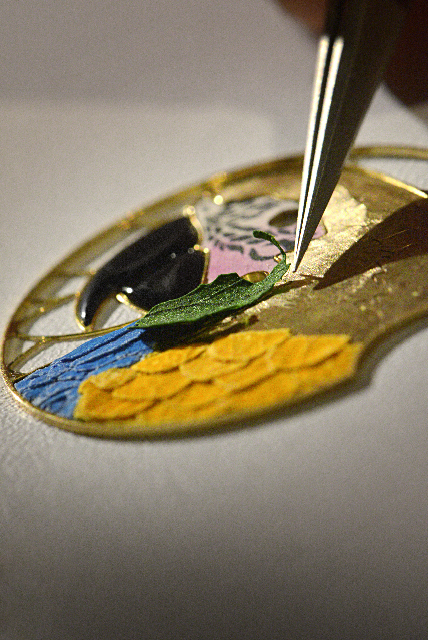 Moreover, it opens a brand new path Cartier is willing to go : floral marquetry. Marquetry has been used for dials for a long time. Cartier itself made a couple of such watches in the 70’s, which are true collectors now. Closer from us, Delaneau made a wonderful piece with an ebony dial, as well as Cvstos, with magnificient tek dials. Bovet also made a limited edition of its Chronographe Cambiano Cambiano with an oak dial. 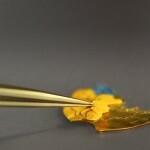 However, wood is challenge for watchmakers and dial makers, as long as it’s sensitive to light and humidity. A piece of wood is a living piece, and watches don’t like nothing but elements that are 100% stable through the centuries. 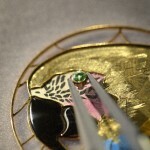 That’s why this new « Métiers d’Art » by Cartier is interesting. 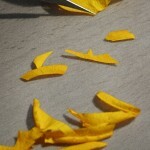 In fact, it does not deal with a piece of wood as such, but with petals. These are even thinner than a piece of wood and consequently more difficult to work – especially in the way they are set and sticked on the dial. Cartier also tainted them so that their colors don’t vanish. Such is the challenge that Cartier has been pursuing for several years, during which time it has built up a new collection of watches. 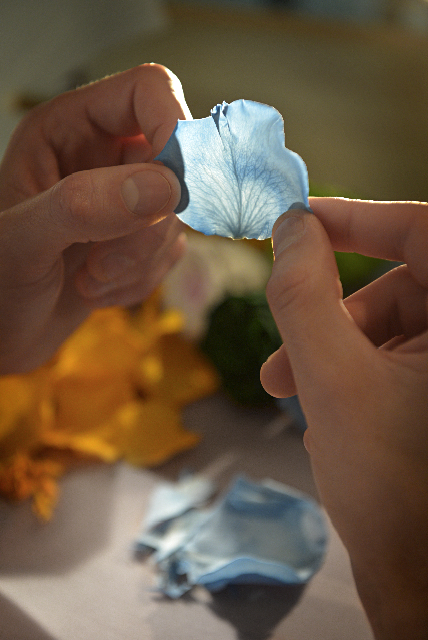 In celebration of the ephemeral beauty of flowers and in order to preserve it for eternity, Cartier invented the floral marquetry, applied here to a Ballon Bleu de Cartier 42 mm watch. 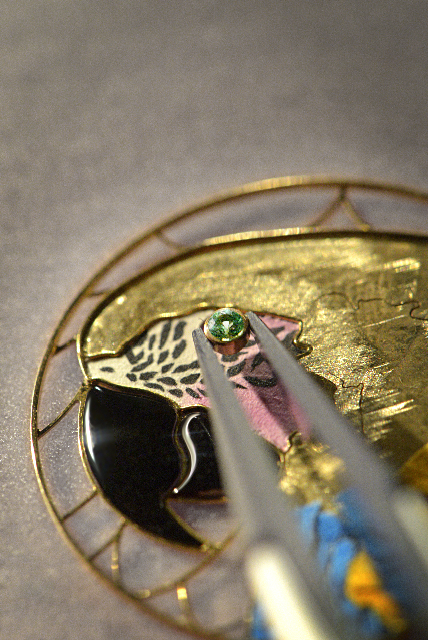 This watch stands at the crossroads of two kinds of craftsmanship: the one, never before seen in watchmaking, immortalises flowers and their beauty; the other, that of the jeweller, enhances the dial’s precious nature. 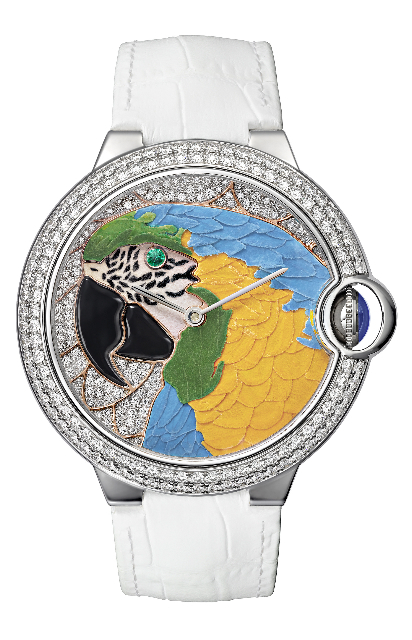 When the two combine, there is an explosion of colors : the blue and the orangey-yellow of the plumage, the deep black of the beak, the emerald green of the eye and the sparkling white diamonds in the background of the dial and on the crown. 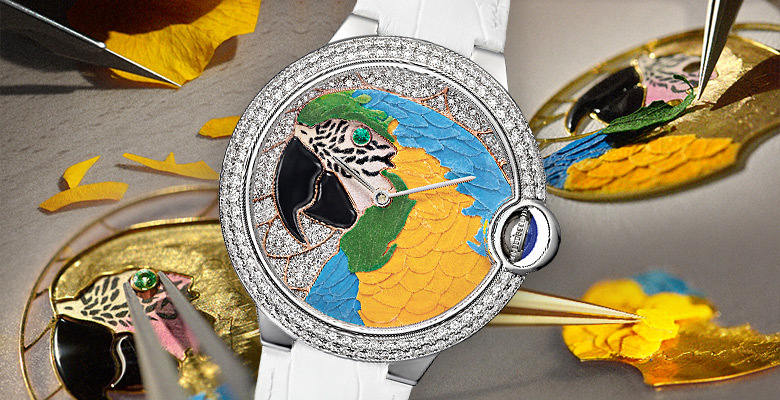 Never has a Ballon Bleu de Cartier watch contained such a palette of colours ! 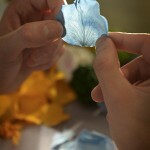 Making the ephemeral eternal takes time. 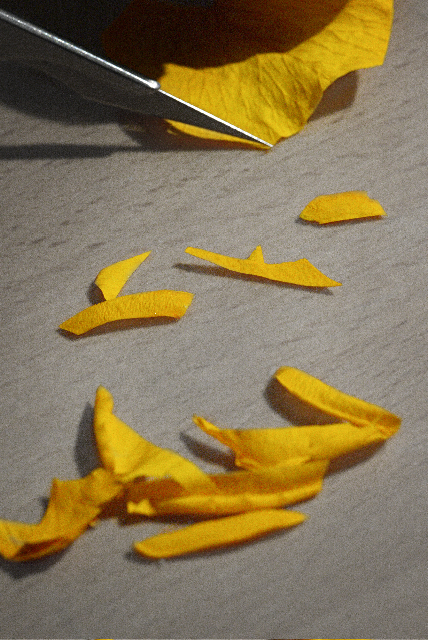 A multitude of minute operations follow one after the other: the flower petals are gathered and coloured, each petal is then stuck onto a thin piece of wood and cut into the desired shape using a marquetry saw. Thus transformed, they become feathers and plumage, a precious, noble material with a volume and texture that contrast with the shine of the onyx beak and emerald eye. 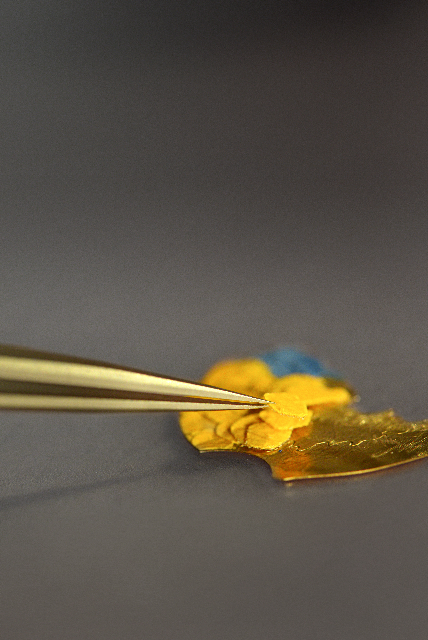 The grey and black feathers surrounding the eye are created one by one with miniature painting. 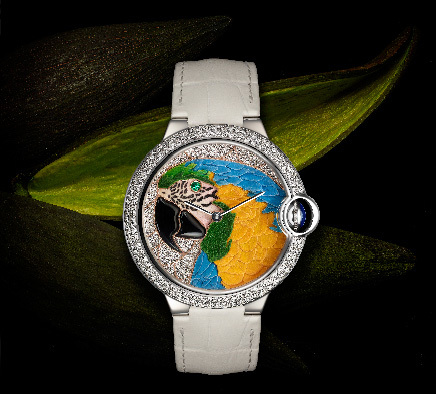 Several hours of marquetry and stone-setting work within the manufacture are required for the dial of this creation to come into being. 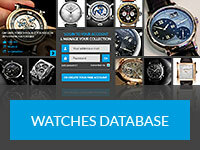 More resources about Cartier Ballon Bleu Floral Marquetry on WatchBySJX and Forbes.